Erin has always wanted to act. It's really all she's ever wanted to do (Well, and dance - but that's another story). In pursuit of that, Erin has been studying acting and performing since 1973 (gack, can it really be that long?). ​She graduated with a B.A. from Bard College (in drama and choreography) and then lived the actor-ey life of a 20 something in NYC (cocktail waitress, temp, auditions, extra work on Law and Order, and lots of macaroni and cheese). Next, she traveled, worked with individuals with intellectual disabilities, married, renovated her house (talk about drama), raised 2 children, learned to walk two dogs at a time, AND braved Disney World in August and Harry Potter World at Christmas. In 2016, Erin, Noah Michael Levine, and Renea Mason won an Audie Award in the Erotica Category for Renea's 'Curing Doctor Vincent'. Erin has fallen in love with the medium of audiobooks (both as a listener and a performer). What a great challenge for an actor - to play ALL the parts! She has also turned into a big old Shakespeare geek. Be careful asking her about anything Shakespeare related, you may get a very enthusiastic and long-winded response. She takes class with Red Bull Shakespeare and Shakespeare & Co. whenever she can and has studied Shakespearean Clowning with Zach Fine and Andy Grotelueschen from Fiasco Theater. 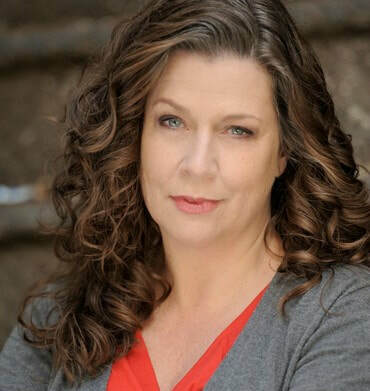 In addition, Erin provides audio description services, as a writer, describer, narrator, director, and casting consultant. Audio description is a translation of visual images into auditory images inserted into pauses in the dialogue of a movie, play, show, opera etc. This concise and evocative additional "soundtrack" helps people with low or no vision to more fully access media and culture. Erin lives in Nyack, NY about 30 minutes outside of New York City, with 2 big and ill-behaved dogs, a teenager (sometimes a twenty something son), and her husband. She loves to help others find their acting voice and to train people in how to write audio description (hit her up). She bristles when people in NYC knowingly say "Oh, you live upstate". For the record she can be in midtown in less time than it takes another person to get from Williamsburg to Grand Central. She is a suburban mom Supergirl in her Toyota and the West Side Highway is her cape!